To this end Stantec, the Canadian architecture firm with an operation in London, was appointed. Stantec chose Dernier & Hamlyn to provide five of the building’s bespoke light fittings. Stantec reviewed our extensive archive and selected beautiful chandeliers as inspiration for subtly redesigned lighting that would give a contemporary twist appropriate to this important heritage building. 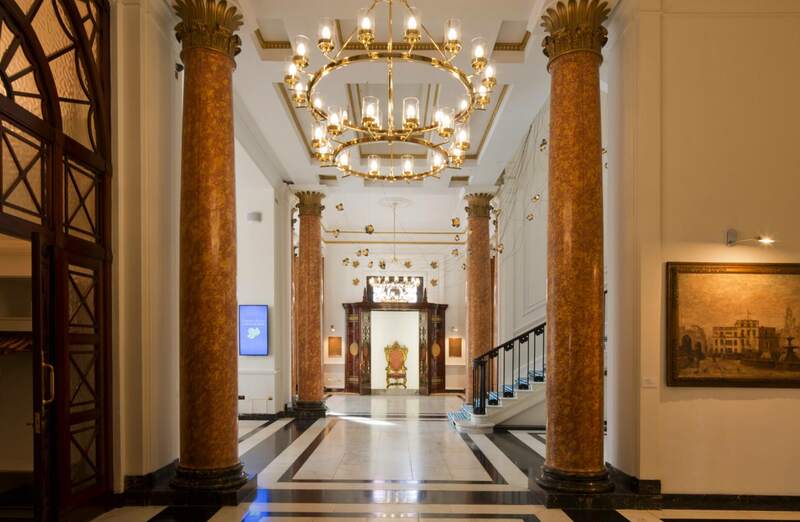 Our team produced the huge bespoke chandeliers for Canada House’s Trafalgar lobby area. They feature large brass rings and cylinder shades formed from handblown glass and are lit by energy saving, low maintenance LED lamps. The delivery deadline for this project was particularly demanding and beyond question as the chandeliers had to be manufactured and installed by our team in time for the official reopening of the building by Her Majesty the Queen. Along with a host of imaginative fixtures from Canadian designers, the Dernier & Hamlyn lighting helps to tell the story of Canada here in the United Kingdom, while appropriately referencing the building’s history.